This is one of the most comforting sauces of all time, it’s not too expensive and you can use it in so many ways! I sometimes make a big batch and use it for different things, storing the various dishes in the freezer until I need them. As usual, I change the recipe depending on what I have on hand and what taste I’m in the mood for. In this case, I happened to have a couple of teaspoons of NoMU’s delicious beef rub [link] left in the tin and I supplemented that with a Knorr beef stockpot. 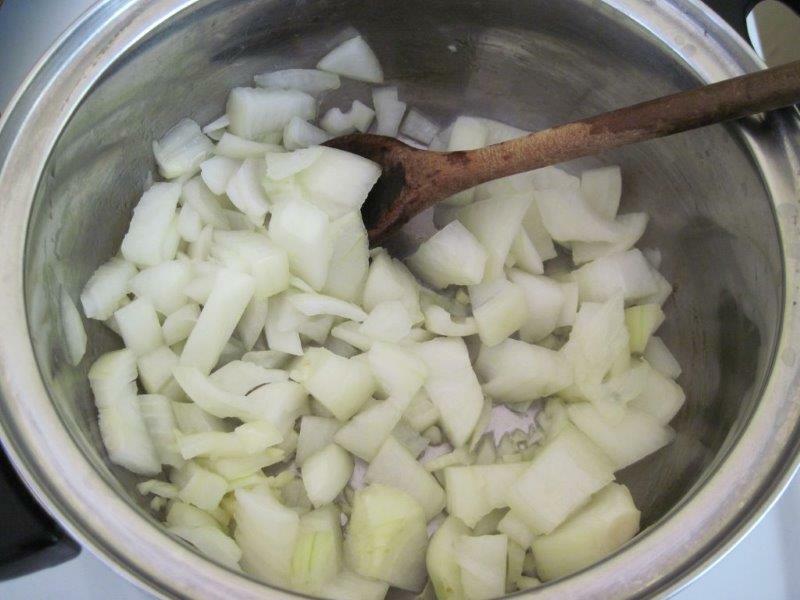 You could also use any other kind of beef stock – home-made, Ina Paarman’s, stock cubes, etc. I also vary the amount of tomato I use depending on how tomatoey I want the dish to taste. 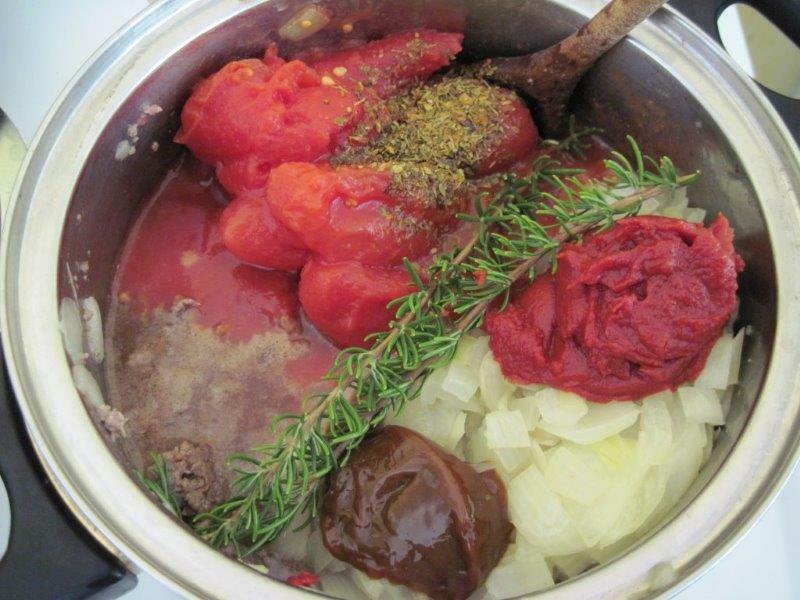 Sometimes I’ll add an extra tin of peeled tomatoes and/or another packet or tin of tomato paste. Traditionally with a bolognaise-type sauce, red wine is used, but I have often used white instead with great success. And a slug of wine is as big as you make it. The wine or vinegar helps the tomatoes to break down and the sugar helps to counteract the acidity of the tomatoes and the wine. If you like a sweet tomato sauce, add more sugar. Herbwise, I like a strongly rosemary-flavoured sauce, but have also used oreganum and/or thyme for a slightly different flavour. 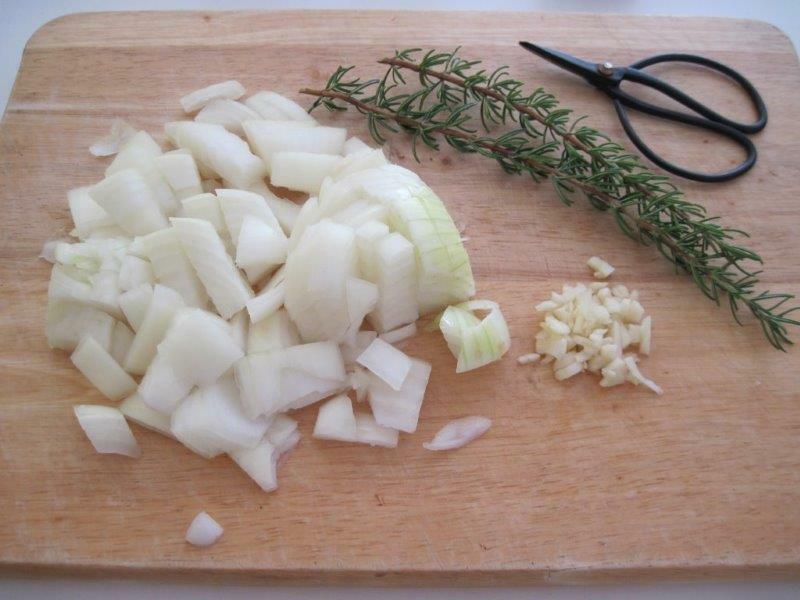 For rosemary and thyme, you can put the whole stalk in since the leaves come off during cooking – just remember to take the stalks out at the end. Bay leaves are another nice addition here, and I also sometimes chuck in a teaspoon of coriander seeds. 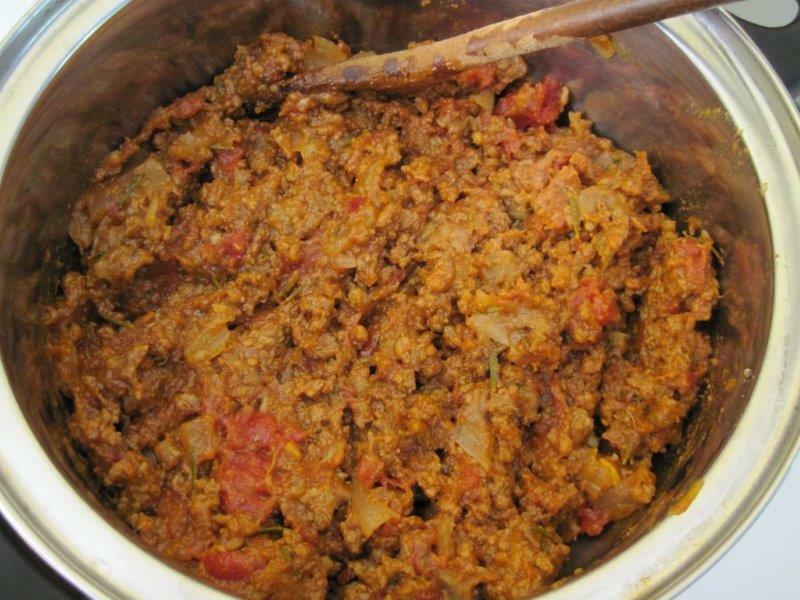 For variation, you can add peeled and thinly sliced carrots, peeled and chopped aubergine, chopped peppers of any description and/or, if you like a bit of heat, some chilli. Make sure you’ve chopped everything as necessary. Heat some oil in a pot and add the onion and garlic. Cook on low to medium heat until softened and becoming transparent. Remove from the pot for now and put a bit more oil in the pot. 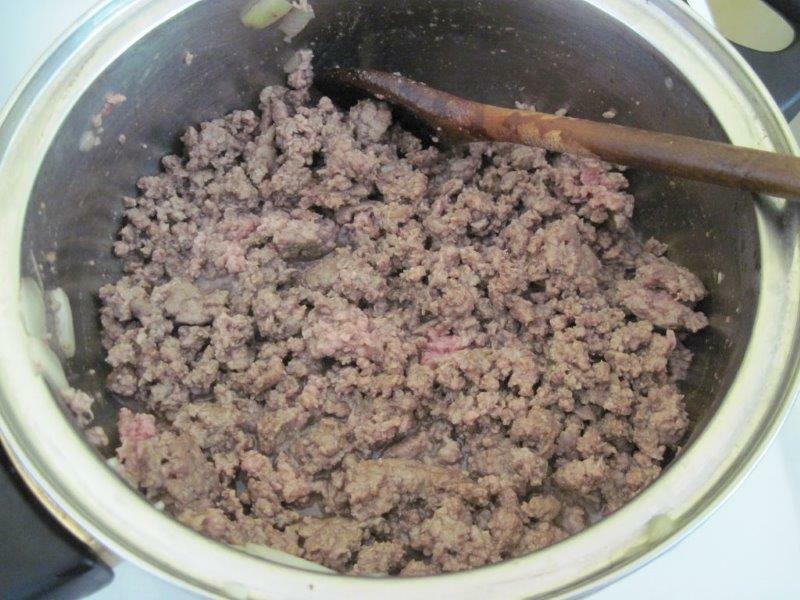 Add mince and break up with a wooden spoon. 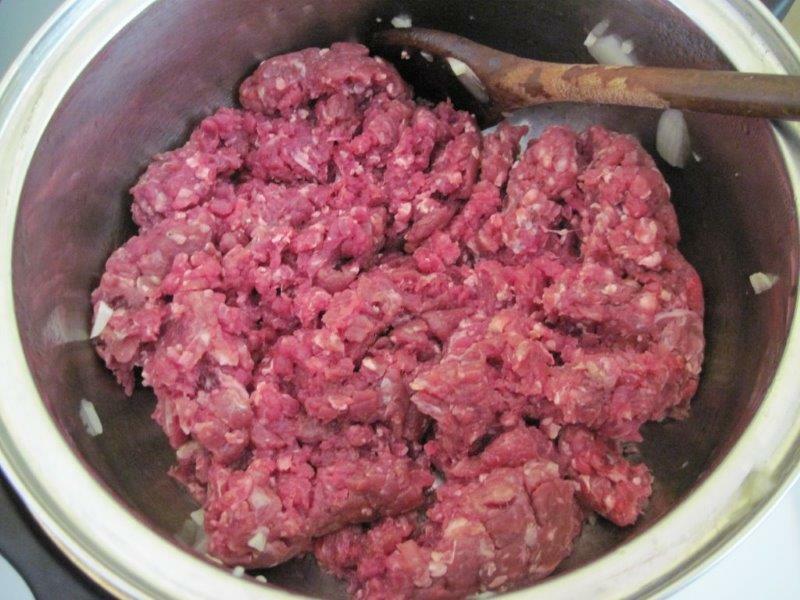 You can leave the onions in if you prefer – it just slows the browning process of the mince a bit as there is less surface area in contact with the pan. 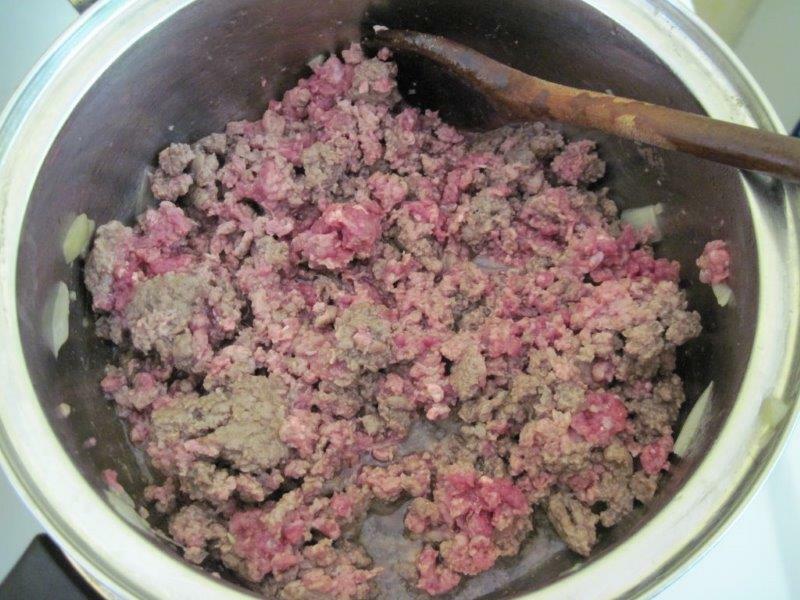 Stir mince frequently until it is all brown, with very few pink bits left. Now add all the other ingredients. Leave to cook on medium heat (it should be bubbling slightly), stirring every now and again. If it starts to look a little dry, add more stock or wine, or even water. Some recipes say it only takes half an hour, but I like to cook mine for about an hour to make sure it’s completely done and all the flavours are blended. If it needs to be drier for your final recipe, cook it a bit longer. Then either use immediately, or cool and store in the fridge or freezer.